Eagles head coach Doug Pederson pauses during a weekly news conference. To hear Doug Pederson tell it — and he told it short and sweet and with a defensive, impatient tone in his voice at a Tuesday news conference — he was concentrating too intently Saturday night on the Eagles' possible divisional-round opponents to wonder how his mentor and friend was holding up after another playoff gut-punch. Andy Reid and the Kansas City Chiefs had lost another postseason game, this time at home, and after building an 18-point lead, to the Tennessee Titans. It was the seventh time Reid had lost over the last eight playoff games he has coached, but if he had hoped to hear a friendly voice over the phone say to him, I know you're hurtin', Big Red. If you need to vent, go ahead. Time's yours, that voice wasn't going to be Pederson's. "I was focused on a couple of teams this weekend," Pederson said. "Didn't talk to him." This answer was among the briefest that Pederson gave during an uncharacteristically testy interaction with media members Tuesday. The news conference was Pederson's first this week, and if he wanted to strike a buttoned-up, no-nonsense pose ahead of the Eagles' game Saturday against the Atlanta Falcons, he instead came off as an edgier iteration of himself. For whatever reason, he was a different Doug, and that's always a risky move for a coach in a single-elimination tournament. 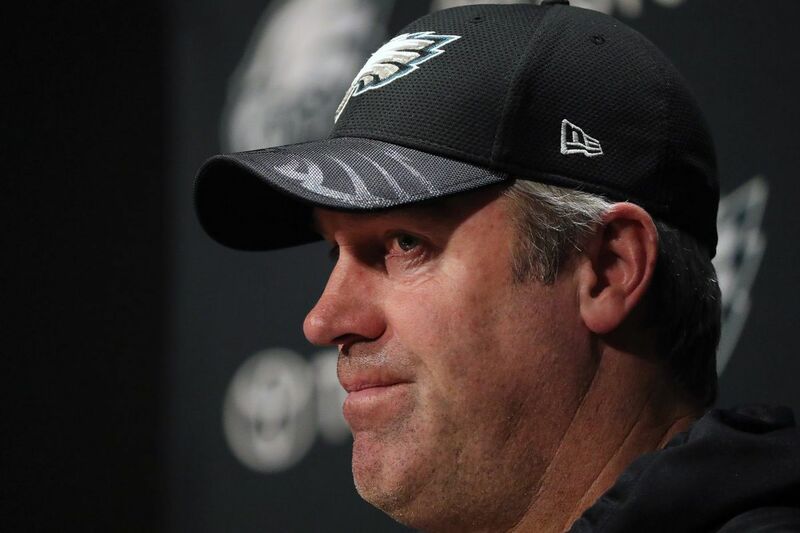 It cuts to the heart, really, of the greatest challenge any NFL head coach — could be Pederson, a playoff neophyte; could be Reid, so established in the league he's practically an institution — faces during the postseason. What do I change, and what do I keep the same? Answering that question correctly is no easy task, and lately, Reid keeps answering it incorrectly. Throughout his 20 seasons in the NFL, he has been a terrific regular-season head coach, rebuilding the Eagles and Chiefs, winning at least 10 games in a season 12 times. The methodical, let's-get-down-to-work approach that he has cultivated over all that time has resulted in relatively consistent success, and for a while, it carried over into the postseason. Heading into the 2008-09 NFC championship game as the Eagles coach, he had a 10-6 playoff record, and the Eagles had a one-point lead late in that championship game before Kurt Warner drove the Arizona Cardinals for the winning touchdown. Since then, though, Reid's only postseason victory occurred on Jan. 9, 2016, when the Chiefs shut out a Houston Texans team that started Brian Hoyer at quarterback, and he has become the only NFL coach to blow an 18-point lead twice in the playoffs. Stating it that way doesn't even do justice to the ignominy of Reid's achievement, because in the first of those games, a 45-44 loss to the Colts in Indianapolis on Jan. 4, 2014, the Chiefs led, 38-10, early in the third quarter. And if there's a common thread to Reid's 1-4 playoff record in Kansas City — one that will sound familiar to anyone who followed the Eagles during his tenure here — it's that perhaps Reid's pass-happiness gets predictable and, for better opponents, easier to defend. The Chiefs passed the ball on 59 percent of their plays over the five games, and after taking that 28-point lead against the Colts and that 21-3 halftime lead over the Titans, Reid had his team throw the ball 36 times and run it 15. Has Pederson, who was Reid's offensive coordinator for Reid's first four playoff games in Kansas City, derived any insights or lessons from his mentor's quick exits? He wouldn't entertain the question Tuesday: "I don't get into that, honestly." Given that Reid, arguably to a fault, has taken care to maintain the same demeanor, the same scheduling and game strategy, the same everything from the regular season to the postseason, Pederson's new pose this week as Captain Intensity was all the more unusual. There's a difference between a coach's tweaking an offensive and/or defensive game plan to counteract a particular opponent — as the Eagles will do for the Falcons, and vice versa — and a coach's presenting a completely new demeanor in public or disrupting the habits and expectations of his players. The former is always necessary. The latter, no matter the coach's intentions, can come off as a sign of panic. "We do try to make those parts stay really familiar," said Falcons coach Dan Quinn, who shepherded his team to last year's Super Bowl in his second season as a head coach. "I'm talking about the interaction with the players, the routine to get ready to play, the process, the game-planning. As a performer, which the players are, we want to make sure their routine stays really ready. Now, within each week, there are some small adjustments that you want to make in the game plan based on the opponent, based on the situation. But I would say for us, and it's at least my philosophy, we wanted to make sure for the players we stay really consistent." Doug Pederson took the podium Tuesday and dared to tempt that philosophy. Was it an astute coaching move by a man who has been surprising people all season? Come Saturday at 4:35 p.m., time's his.